Originally taught at The CreativFestival in Toronto, October 2006. 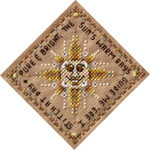 Finished design size: @ 2-3/4" X 2-3/4"
Description: A very small design featuring a smiling sun. Metallic braid adds a bit of glitter, and a couple different specialty stitches add textural variety. Background Information: Celestial Sun was designed as a partner piece for Jennifer Aikman-Smith's (Dragon Dreams) Celestial Moon design. Both pieces were part of a progressive-style class we both taught along with Doug Kreinik of Kreinik Manufacturing at Toronto last fall. The designs were made to be stitched together as a scissor fob; the colors coordinate beautifully! Also designed for this class were my Sun Dragon, and Jennifer's Moon Dragon, both designs also available only at PatternsOnLine.com. Stitching Comments: A very small and fun-to-stitch design.